Sometimes, things don’t go as you plan in the kitchen. At least, that’s what happens at my house. Take the bananas that no one ate. Warmer weather means a shorter shelf life for the bananas, and I am less ambitious in the kitchen the warmer it gets. As a result, I found myself procrastinating as the bananas passed the point where someone would eat them, then they passed the point where I could use them in banana pudding. Finally, they were beyond even an ingredient in a smoothie. We had arrived at D-day. D stands for decision. I had to use the bananas or throw them out. Anyone who has been a regular reader here at Patty Cake’s Pantry knows that we don’t like to throw out, or waste, our groceries, so I had to use them. I know that a lot of people would look at the bananas in the photo above and say gross, but around here, as long as the bananas are still semi solid with no visible mold or leaking fluids, we use them. When they are black all over, the only real use for them is in banana bread. but banana bread requires me to measure and mix. What should I do if I’m tired and lack ambition? Sometimes, you just want to be lazy. At least there are times when I want to be lazy. It’s hot outside, and I am going to have to turn on the oven and make the house even hotter. I lack ambition. I’ve had a rough day at work, and I’m tired. I don’t feel like working hard. It’s times like these when I turn to simple convenience items that I have in my pantry. In this case, it was cake mixes that I found on an amazing sale a few months back. The were only 59 cents a box. I bought the maximum allowed by my store and so did one of my kids. I was glad I had this abundance of cake mixes. You see, a couple of months ago, I found a recipe by following a link from a recipe at Six Sister’s Stuff. The recipe is for 3 Ingredient Banana Bread. It’s super easy. All you need is a box of cake mix, 2 eggs, and 3 ripe bananas. Mix it up by hand until everything is mixed together. It’s super easy, requires no measuring, and I can have it in the oven in just a few minutes. Sometimes the hardest part is opening the cake mix and peeling the bananas. Here’s the instructions…peel the 3 bananas and mash them in the bottom of a mixing bowl with a fork, or potato masher, or whatever your favorite mashing tool is. I favor the fork. Finally, add the cake mix and mix until everything is incorporated. 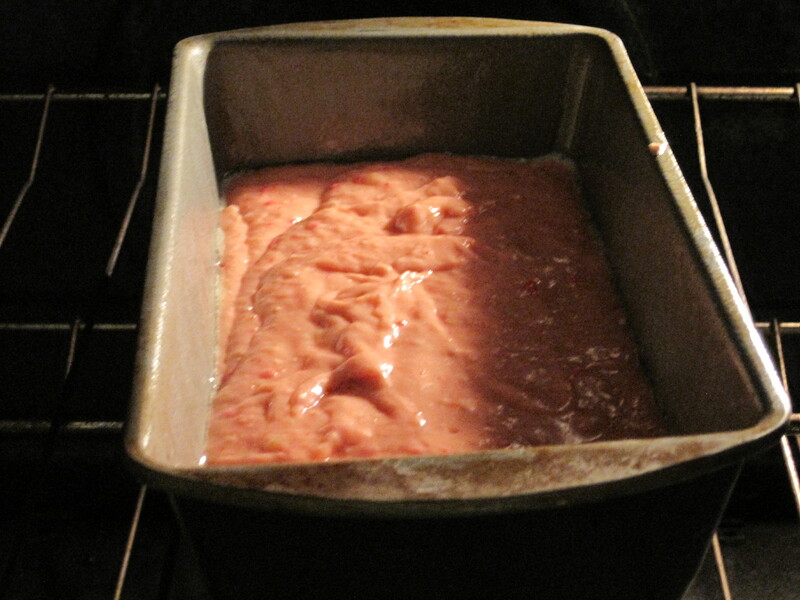 Pour the batter into a well greased loaf pan. 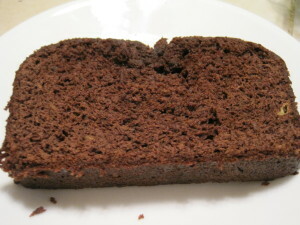 We have made this bread quite a few times using different cake mixes. 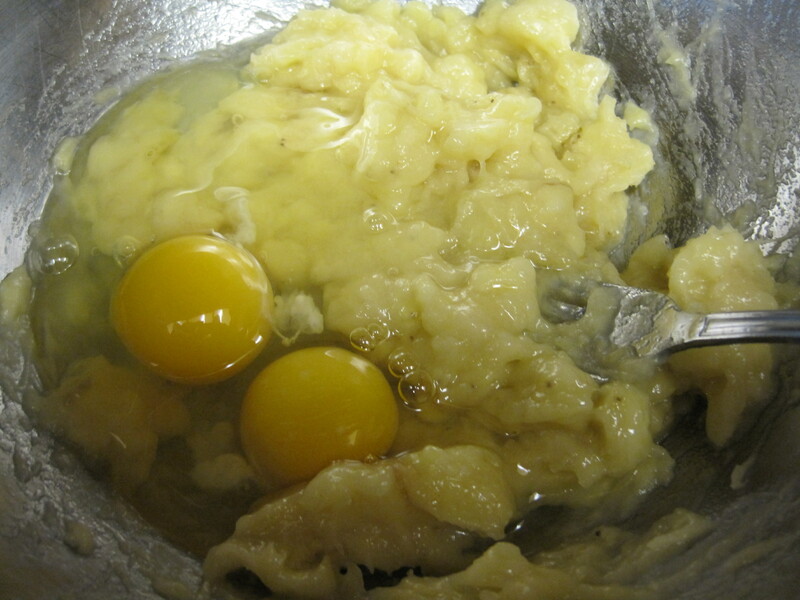 The original recipe called for a yellow cake mix, so the first time I made it, we used the yellow cake mix. A couple of times, we stirred in other ingredients like a cup of chocolate chips, or a 1/2 cup of chopped nuts. The first departure from the recommended cake mix was when we tried the recipe with a spice cake mix. Spiced Banana Bread, as we called it, was very good. 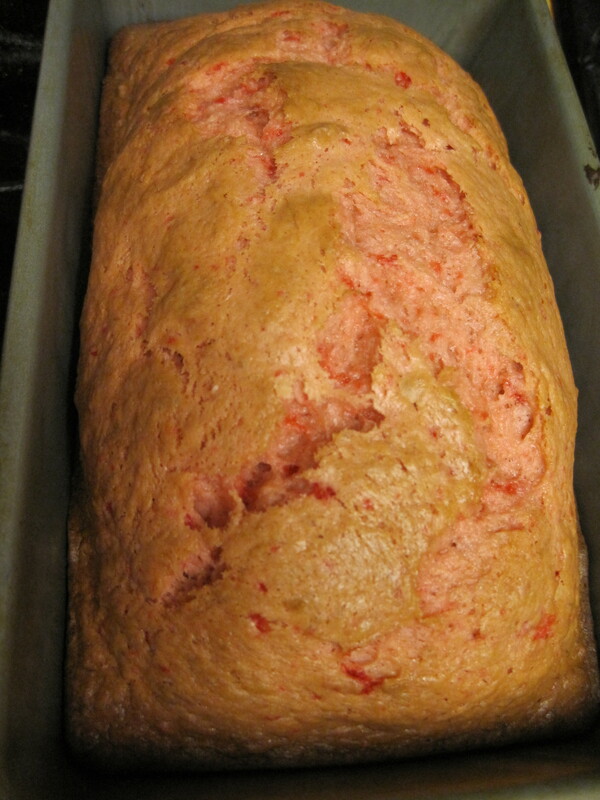 Next we tried a strawberry cake mix because everyone loves strawberry-banana. 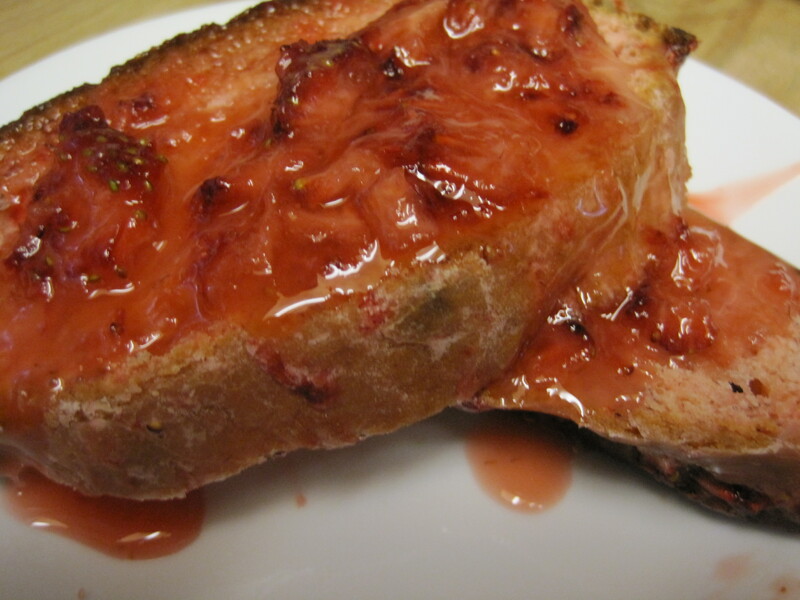 We even macerated some sweetened strawberries to put on top of the slices when we served it. Can you say “Yum”? 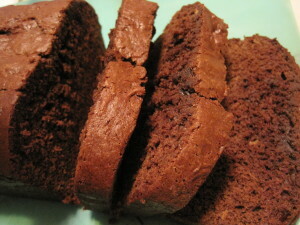 Most recently, we used devil’s food cake mix. 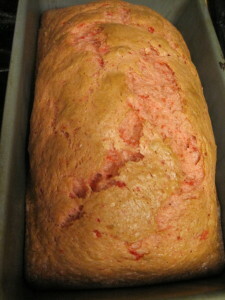 No matter what flavor cake mix we have used, it comes out perfect every time. Each one has been very tasty. I plan to try an orange or lemon cake mix next. I think the citrus should go well with the bananas. Here’s the recipe. I hope you like it as much as we do. Thanks for visiting. A 3 ingredient recipe that's a great way to use up those over ripe bananas. It's super simple and super tasty. 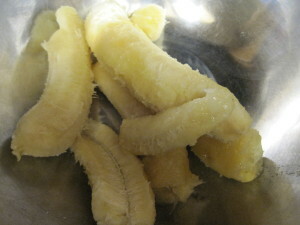 Mash bananas in mixing bowl until they form a puree. Add two eggs and mix until well incorporated. Bake at 350 degrees for 45 to 55 minutes or until a toothpick inserted in the middle comes out clean. Allow bread to rest for 10 minutes in the pan. Remove from pan and place on a rack to finish cooling. I call this an up-cycled recipe. Up-cycling is taking would-be waste products and turning them into something useful. In most North American homes, these bananas would have gone into the trash. Instead, they were turned into a delicious dessert or snack. It’s really a skill that our grandmothers and great-grandmothers all possessed, but it has been lost over the years. I plan to periodically publish an “up-cycled” food recipe. The tropical tapioca recipe I posted a few months ago was another “up-cycled” food recipe. IMPORTANT: The things that I am up-cycling have never actually been in the trash, they are not expired or spoiled. They have all been properly stored. NEVER EAT SPOILED FOOD or food that has been improperly stored. 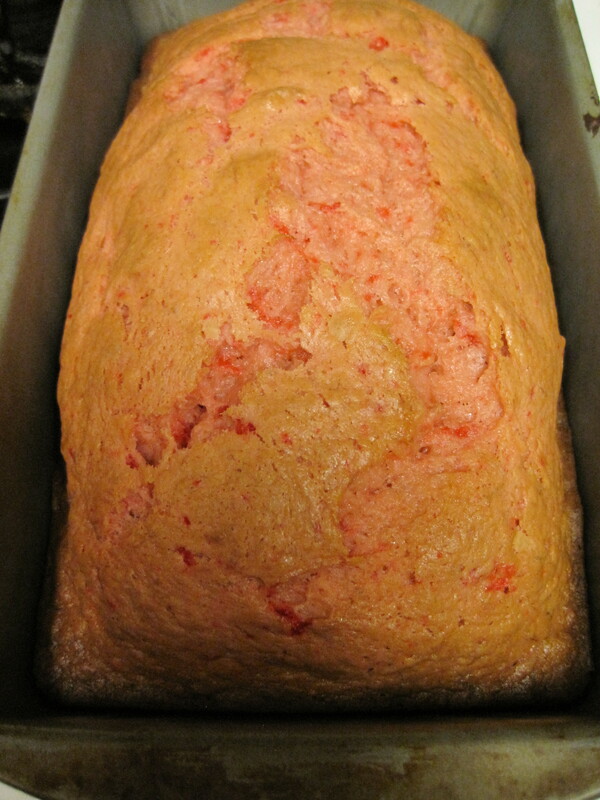 Since my bread is pink, I think we’ll link up with Beverly’s Pink Saturday. Come and check it out. Now that is the way to do it Patty! It looks great! You are a brave women! Thanks for visting me today at homemaker-mom… I am so happy to of found your blog too! Thanks. I love Simple recipes for those times when I just want to get things done. Sorry, I just cannot go an overripe banana.I want them half green. In a cake or something they are good,but not to eat. You are not alone. No one in my house will eat them over-ripe, either. That’s why I make banana bread and smoothies. Fun banana fact. Stick a banana in the refrigerator and leave it there for a couple of days. 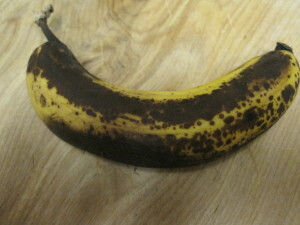 The peeling will turn dark, but the banana stays just as fresh as the day you stuck it in there. The downside of this is that my kids, and hubby, can’t get past the fact that the peeling turned dark. I have to peel their bananas out of site and serve them in a bowl on the side of their breakfast or the bananas will never be eaten. Thank YOU!!! We have from one to three bananas in varying stages of wear and tear at all times in the kitchen pass-through. 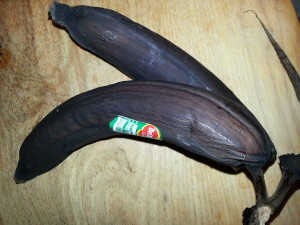 I’ve tossed several in the past month (mostly because gnats were enjoying them more than we could), and always have a pang of conscience—my dear late FIL kept bananas WAY past their shelf life, on into the liqueur-inside-a-peel stage, and I think of him every time I slip up and let one go to waste. I’m going to try that recipe this weekend—also hit a cake mix sale lately and have spice, strawberry and carrot on hand. I don’t know if the bananas would work in a carrot cake mix because the directions for preparing it are so different. Either of the other two would be great, though. I am glad that you found my post helpful. Thanks for stopping by my site. Let me know how you like the bread. This looks like a super easy and wonderful bread! It looks so moist! Thank you for sharing this recipe! LOL – up-cycled recipes! Love it! 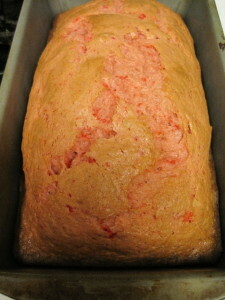 The strawberry-banana bread looks pretty with its swirled pink. Sounds yummy.